In order to begin the restoration project we commenced a month ago, I had to box up the contents of our bookshelves. Not once have I had any need or desire to open any of those boxes and retrieve a book. Which leads to an uncomfortable question for an author: do I need to own any books? 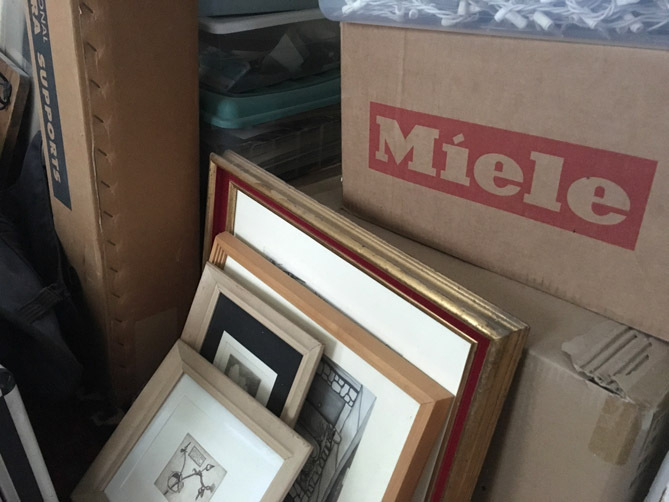 One of the extreme tidying methods suggested by Fumio Sasaki, author of Goodbye Things, is to box your possessions, wait for a reasonable period of time and if you don’t use any of those items, send them to the thrift store. If I were to use this method my entire library, with the exception of a few books I left out of the boxes, would be cast off. I’ve read and will probably never read again. I will probably never read but think that I should read. Are a souvenir of some place or experience. To which we contributed articles or chapters. I know the library doesn’t have and that I think I will read someday. Which are reference books or cookbooks that we regularly use. These latter books I will keep but could probably do without (I lack the iron will of Fumio Sasaki). Interestingly, I’ve found myself reading more now that I can’t access my books. Three days a week I go to the YMCA which is mere steps from the vast Los Angeles Central Library. I can, pretty much, find any book I want there. I also have an iPad which I use to download public domain books as well as some new ebooks that the library makes available for free. Sometimes one’s personal library can devolve into a kind of virtue signaling, a way to seem smart when visitors drop by. In my case it’s definitely time for a book winnowing and, yes, I will still have a bookshelf populated with books I use for reference. Kelly has her own books and shelf. Of course books have a tendency to accumulate and I have no doubt that I will have to go through a book cleaning process again in the future. In the meantime I hope to remember that books are meant to be read, used and passed on to someone else. An old idea still practiced in some northern European countries, dissolved soap flakes can be used as a furniture and floor finish. Soap is non-toxic and, as Christopher Schwarz points out in this video, your clothes get cleaner when you take on this annual chore. And that’s the only catch: like wax, you have to re-apply at least once a year as part of a household wide soapy cleaning ritual. More detailed info on soap finishes here. 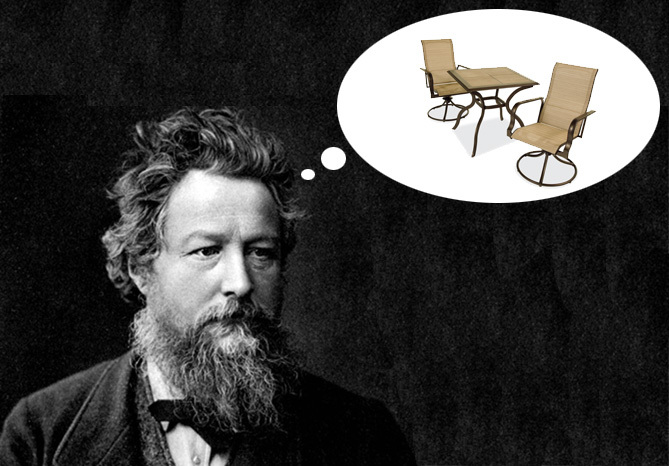 What Would William Morris Say? 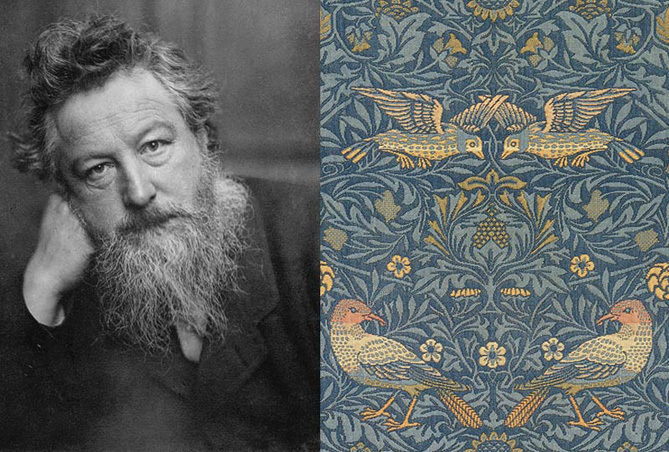 William Morris, one of the most prominent members of the Arts and Crafts movement, took part in a last ditch effort to bring dignity back to work and stave off the horrors of an industrialized, consumer culture. His mantra, “Have nothing in your houses that you do not know to be useful or believe to be beautiful” is a sentiment I feel the need to foreground in my own struggles with clutter and consumer culture. This is why I’m introducing the new William Morris Meme™. 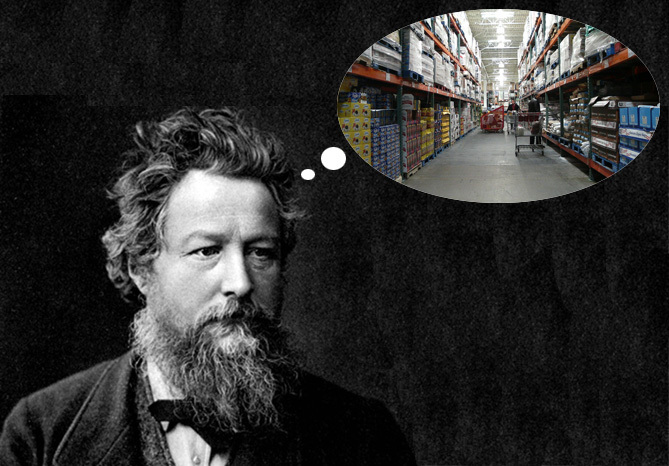 I know, the salmon is a bargain, but William Morris thinks you’ll end up with a basket full of pizza pockets and a Taco Bell hoodie. How about spending some time on Facebook? I think I’ve got the makings of a new anti-consumerist app. 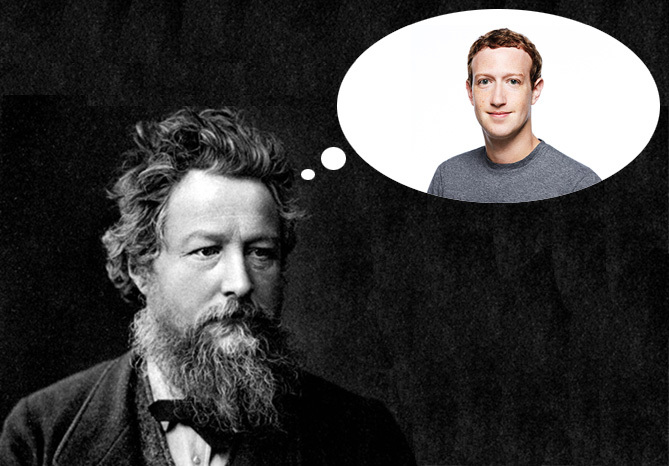 Unfortunately, I doubt that Zuck’s tech-bro pals will send over any venture capital. In Swedish, the word is “döstädning” and it refers to the act of slowly and steadily decluttering as the years go by, ideally beginning in your fifties (or at any point in life) and going until the day you kick the bucket. The ultimate purpose of death cleaning is to minimize the amount of stuff, especially meaningless clutter, that you leave behind for others to deal with. The article goes on to describe Margareta Magnusson, the doyen of Swedish death cleaning, as Marie Kondo with a dose of momento mori. Not having read Magnusson’s book, The Gentle Art of Swedish Death Cleaning, I can’t comment on the method’s effectiveness, but its clear that both Magnusson and Kondo are addressing a universal problem of our consumer culture: too much stuff. It seems to me that there are two foundational skills that inform everything else that we humans do: the study of philosophy and the knowledge of how to sharpen our tools. I studied neither philosophy nor sharpening in school but I’m determined to fix these two gaping holes in my education. I won’t bore you with an account of my philosophy self study but I would like to share what I learned about sharpening this past weekend. While one can pick up a lot about philosophy from reading books, sharpening is a skill best learned hands-on. For this reason I’m not going to give detailed sharpening instructions in this post but I will note the basic principles. It’s simple: you move from course abrasives to finer ones and finish with polishing. 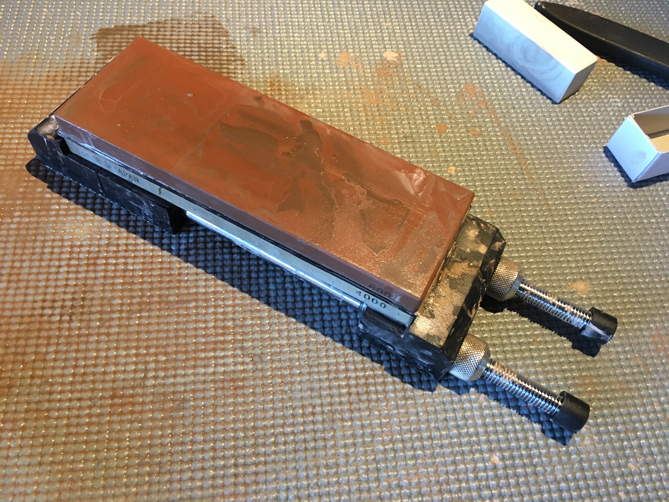 If you’re working on a damaged tool, say a chisel that hit a nail or a knife that was used improperly, you will need to start with a grinding wheel or a really coarse abrasive. Nagura stone (used for maintaining whetstones). In terms of price and versatility, it’s hard to beat a Japanese whetstone. With a set of whetstones you can polish everything from kitchen knives to chisels and planes. 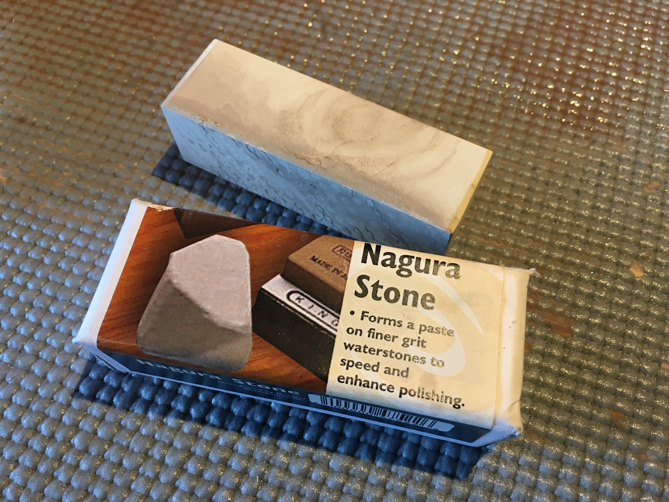 After the sharpening class I picked up a double sided 800/4,000 grit whetstone and few additional accessories: a sharpening stone holder, a honing guide, a nagura stone and a knife strop. 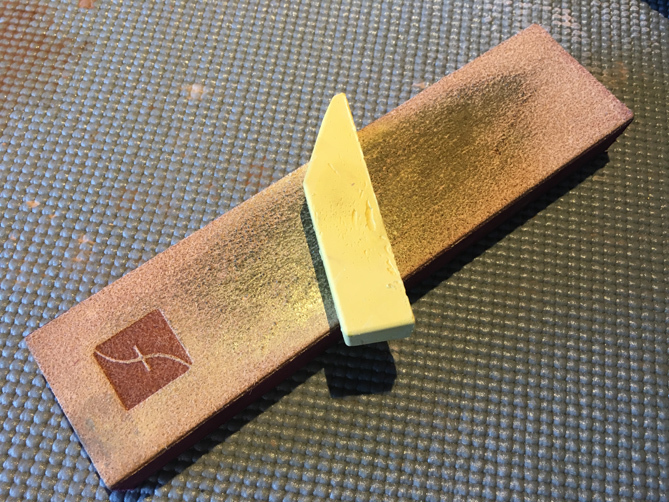 The holder keeps the stone from slipping on your work surface, the honing guide helps you hold the right angle when sharpening chisels and planes, the nagura stone is a hard stone used to flatten and maintain the whetstone and the strop (just a piece of leather mounted to a board) is the last step for polishing your tools. The strop comes with a stick of abrasive that you rub on the leather. 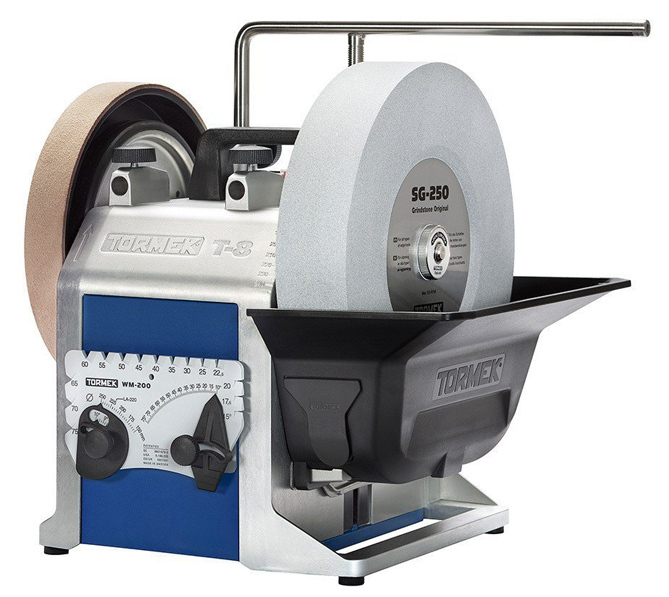 At the sharpening workshop we also had a hands on session with the Saab of sharpening tools, the Swedish-made Tormek T-7. The Tormek will set you back $800 plus at least $200 more for a set of guides. At that hefty price tag it’s a tool for zealots or future sharpening entrepreneurs. We also looked at but did not use a more economical Work Sharp tool sharpener that both grinds and polishes. Sharpening is one of those topics that inspires spirited debate and lengthy conversations involving bevel angles and the finer points of metallurgy. But one need not get lost in the details. Just take a class (the one I took was at a Rockler store) and practice. That’s what I did and now our knives cut tomatoes, our garage is full of sharp chisels and all I can think about is the ontology of bevel angles and the teleology of chisel metallurgy.